Athel Vincent Arney was born on 8 December 1924 at Tulare, California. He was the son of Lawrence Corwin Arney and Eliza Verna Vincent. Athel Vincent Arney married Nona Mae Abraham, daughter of Arthur Matthew Abraham and Hannah Wilhelmina Groon, on 18 August 1946 at Riverside Lutheran Church, Sioux City, Iowa. Athel Vincent Arney died on 9 November 2012 at age 87. Athel Vincent Arney emigrated on 3 June 1945 from New York Arrival Date: 3 Jun 1945 Ship Name: Monticello Port of Arrival: New York, New York. He and Nona Mae Abraham lived in 2002 at Sun City West, Arizona. Athel Vincent Arney and Nona Mae Abraham lived in August 2009 at Sun City West, Arizona. [S250] U.S. Federal Census 1930 U.S. Federal Census, by Ancestry.com, ED54-29. Dwelling 292. Lawrence Corwin Arney was born on 18 January 1881 at Iowa. He was the son of John H. Arney and Amanda J. Sweeney. Lawrence Corwin Arney married Eliza Verna Vincent, daughter of (?) Vincent and (?) Chivers, on 13 September 1905 at Tulare, California. Lawrence Corwin Arney obtained US Social Security Card; reported in CA Death Index. On 12 September 1918 at World War I Draft Registration, Tulare, California. [S245] U.S. Federal Census 1900 U.S. Federal Census, by Ancestry.com, ED60. Dwelling 149. Name Variation Eliza Verna Vincent was also known as Verna T.
Name Variation Eliza Verna Vincent was also known as Vera Elizabeth. Name Variation Eliza Verna Vincent was also known as Verna Eliza. Married Name 13 September 1905 As of 13 September 1905,her married name was Arney. Eliza Verna Vincent was born on 31 May 1887 at California. She was the daughter of (?) Vincent and (?) Chivers. Eliza Verna Vincent married Lawrence Corwin Arney, son of John H. Arney and Amanda J. Sweeney, on 13 September 1905 at Tulare, California. Eliza Verna Vincent obtained US Social Security Card; reported by CA Death Index. She had 3 with 3 living in 1910 children. Married Name 30 June 1914 As of 30 June 1914,her married name was Kantowski. She was the daughter of William Rowen Borst and Matilda Augusta Mason. Jessie Lenore Borst married Leo Alexander Kantowski, son of Frank Antone Kantowski and Selma Amalia Pfotenhauer, on 30 June 1914 at Hughes, South Dakota. [S9] South Dakota, South Dakota Birth Records South Dakota, State File Number: 562000 (unknown file date). [S245] U.S. Federal Census 1900 U.S. Federal Census, by Ancestry.com, ED181. Dwelling 54. [S243] U.S. Federal Census 1920 U.S. Federal Census, by Ancestry.com, ED188. Dwelling 21-23. [S250] U.S. Federal Census 1930 U.S. Federal Census, by Ancestry.com, ED33-13. Dwelling 89. Gilbert O. Kjos was born on 9 May 1893 at Iowa. He was the son of Martin Kjos and Anna Minnie Halber. Gilbert O. Kjos married Julia Alvida Ness, daughter of John S. Ness and Mary Fanske, circa 1925. Gilbert O. Kjos married Dorothy Hebeler, daughter of John Hebeler and Edith Healless, after 1930. Gilbert O. Kjos died in December 1964 at age 71. Gilbert O. Kjos obtained US Social Security Card at Iowa; last residence listed as Iowa. [S245] U.S. Federal Census 1900 U.S. Federal Census, by Ancestry.com, ED164. Dwelling 69. [S244] U.S. Federal Census 1910 U.S. Federal Census, by Ancestry.com, ED205. Dwelling 10. [S243] U.S. Federal Census 1920 U.S. Federal Census, by Ancestry.com, ED203. Dwelling 180. Married Name after 1930 As of after 1930,her married name was Kjos. Dorothy Hebeler was born on 26 July 1909 at Iowa. Dorothy Hebeler married Gilbert O. Kjos, son of Martin Kjos and Anna Minnie Halber, after 1930. Dorothy Hebeler died in September 1994 at age 85. Dorothy Hebeler obtained US Social Security Card at Iowa; last residence Sioux City, Woodbury, Iowa. Myron Leroy Abraham was born on 20 October 1921 at Alcester, Union, South Dakota. He was the son of Alfred Rudolph Abraham and Josie J. Jamtgaard. Myron Leroy Abraham was baptized on 13 November 1921 at St Peters Lutheran Congregation, Union, South Dakota. He married Esther May Ebsen, daughter of Peter Ebsen and Serena Christensen, on 26 November 1965 at Augustana Lutheran Church, Sioux Falls, Minnehaha, South Dakota. Myron Leroy Abraham died on 23 November 1994 at age 73 also reported as 21 Nov 2004. Myron Leroy Abraham obtained US Social Security Card at South Dakota; Last residence Sioux Falls, Minnehaha, South Dakota. On 3 June 1984 at Argus Leader On June 6, 1944, 176,000 troops stormed onto Normandy Beach to liberate France from Hitler's hold. It is a day forever etched in the nation's memory known, simply, as D-Day: Myron Abraham, 62, was 22 when he waded through the green sea towards Omaha Beach, where the French Continent Peninsula sticks its big thumb into the Atlantic Ocean. He spent the night in a foxhole and faced his first German fire the next day. They were South Dakotans at Normandy on D-Day - scared soldiers among the 176,00 troops who stormed the shore June 6, 1944, to liberate France and smash Hitler's Festung Europa. Abraham, a Beresford native, is a husky man with a gentle laugh, now retired and living at 812 W. Madison St., in Sioux Falls. He has outgrown his Army uniform and keeps a purple heart in a lockbox as a reminder of the shrapnel that pierced his left leg along a road in Germany four months after the invasion. Abraham had previous battle experience under Patton in Sicily but was scared when he jumped into the water at Normandy. "If you don't have fear, you're crazy," he says. "You didn't know from one minute to the next if you're going to be dead or alive.. I was on the second wave, and that's the only reason I'm here. The first wave got pretty well wiped out. "3 He lived in 1990 at 1230 N Dakota Avenue, Sioux Falls, South Dakota. [S250] U.S. Federal Census 1930 U.S. Federal Census, by Ancestry.com, ED64-1. Dwelling 5. [S373] U.S. Federal Census 1940 U.S. Federal Census, by Ancestry.com, Year: 1940; Census Place: Glenwood, Clay, South Dakota; Roll: T627_3851; Page: 2A; Enumeration District: 14-4. [S297] Mrs. Leo A. Abrahamson, The Abraham Olson Family - Second Edition, page 69. Married Name 7 March 1939 As of 7 March 1939,her married name was Myhre. Alvira Louise Abraham was born on 10 March 1920 at South Dakota. She was the daughter of Alfred Rudolph Abraham and Josie J. Jamtgaard. Alvira Louise Abraham was baptized on 11 April 1920 at St Peters Lutheran Congregation, Union, South Dakota. She married Oscar Myhre, son of Carl Myhre and Dorthea Marie Barboe, on 7 March 1939 at Lincoln, South Dakota. Alvira Louise Abraham died in December 1991 at age 71. Alvira Louise Abraham obtained US Social Security Card at South Dakota; last residence not specified. Wendell Lourell Abraham married Patricia A. Boyum. Wendell Lourell Abraham was born on 27 May 1926 at South Dakota. Wendell Lourell Abraham was baptized on 27 June 1926 at St Peters Lutheran Congregation, Union, South Dakota. He died on 2 February 2010 at age 83 Wendell passed away of natural causes on February 2, 2010 in Tucson, AZ at the age of 83. He grew up in the farming communities of Alcester and Beresford, pitching baseball and breaking his leg playing football; graduated from Beresford High in 1944, served proudly as an airplane mechanic in the Army Air Corps in WWII. He was married to Patricia Boyum for 52 years, until her death in January 2004. 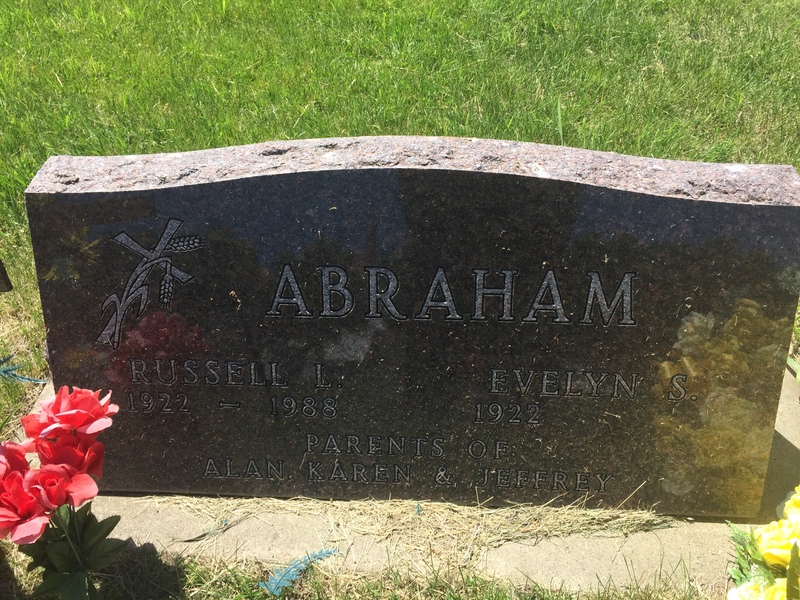 "Abe" enjoyed playing slow-pitch softball with his co-workers at Midwest Coast Transport, always had the greenest lawn in the neighborhood, supported his kids at Lincoln High School football games, and knew what the weather was like in every city where his grown children lived. Wendell is survived by 3 sons: Steve (Laurie) of Rapid City SD; Scott (Charlene) of Broussard, LA; Shawn (Sue) of Aurora, CO; and daughter Sherry of Tucson, AZ; as well as 6 grandchildren: Gretchen, Lea, Dustin, Trevor, Jessica and Kyle; brother Merle, Phoenix; and sister Arlys in Iowa. We will always remember his sense of humor and his stories of dancing with Mom at the Arkota Ballroom to the sounds of Tommy Dorsey and all the Big Bands of the era. Dad, you will never be gone from our hearts and prayers! Memorial reception at Chapel Hill Funeral Home & Crematory in Sioux Falls, S.D. at 2:30 PM on Sat., July 10, 2010. Wendell Lourell Abraham obtained US Social Security Card at South Dakota; last residence Tucson, Pima, Arizona. On 24 November 1944 at U.S. World War II Army Enlistment, Fort Levenworth, Kansas, Name: Wendell L Abraham Birth Year: 1926 Race: White, citizen (White) Nativity State or Country: South Dakota State: South Dakota County or City: Union Enlistment Date: 24 Nov 1944 Enlistment State: Kansas Enlistment City: Fort Levenworth Branch: Air Corps Branch Code: Air Corps Grade: Private Grade Code: Private Term of Enlistment: Enlistment for the duration of the War or other emergency, plus six months, subject to the discretion of the President or otherwise according to law Component: Reserves - exclusive of Regular Army Reserve and Officers of the Officers Reserve Corps on active duty under the Thomason Act (Officers and Enlisted Men -- O.R.C. and E.R.C., and Nurses-Reserve Status) Source: Enlisted Reserve or Medical Administrative Corps (MAC) Officer Education: 4 years of high school Civil Occupation: Student Codes 0x, 2x, 4x and 6x as pertain to students will be converted, for machine records purposes, to the code number 992. Marital Status: Single, without dependents Height: 00 Weight: 000. He lived in February 2008 at 4609 S Louise Ave, Sioux Falls, Minnehaha, South Dakota. Merle Spencer Abraham was born on 8 January 1928 at South Dakota. Merle Spencer Abraham was baptized on 7 April 1928 at St Peters Lutheran Congregation, Union, South Dakota. He married Joan Marie Bruehler on 27 June 1951 at Union, South Dakota. Merle Spencer Abraham died on 4 August 2015 at Phoenix, Maricopa, Arizona, at age 87. On 15 March 1946 at U.S. World War II Army Enlistment, Fort Snelling, Minnesota, Name: Merle S Abraham Birth Year: 1928 Race: White, citizen (White) Nativity State or Country: South Dakota State: South Dakota County or City: Union Enlistment Date: 15 Mar 1946 Enlistment State: Minnesota Enlistment City: Fort Snelling Branch: No branch assignment Branch Code: No branch assignment Grade: Private Grade Code: Private Term of Enlistment: Enlistment for the Panama Canal Department Component: Regular Army (including Officers, Nurses, Warrant Officers, and Enlisted Men) Source: Enlisted Man, Philippine Scout or recall to AD of an enlisted man who had been transferred to the ERC Education: 4 years of high school Civil Occupation: Carpenter, General or Dental Laboratory Technician (Dental technician. ) or Physics Laboratory Assistant or X- Ray Technician (X-ray photographer.) or Dental Hygienist or Medical Technician or Chemical Laboratory Assistant Marital Status: Single, without dependents Height: 00 Weight: 000. Merle Spencer Abraham lived in February 2010 at Phoenix, Arizona. 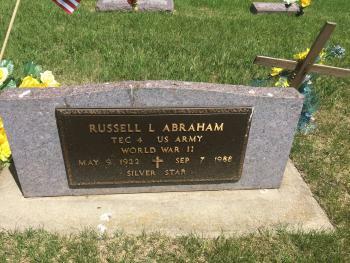 Russell Lester Abraham was born on 9 May 1922 at Spink, Union, South Dakota, twin with Roland Percival. He was the son of John Abraham and Selma Sally Solaas. Russell Lester Abraham was baptized on 3 June 1922 at Brule Creek Lutheran Church, Union, South Dakota. He was buried on 9 September 1988 at Brule Creek Cemetery, Spink, Union, South Dakota. Russell Lester Abraham was confirmed on 25 July 1937 at Brule Creek Lutheran Church, Union, South Dakota. He obtained US Social Security Card at Iowa; Last residence Beresford, Union, South Dakota. [S184] Beresford Republic Newspaper, Vol. 95, 1988, Sep 15. [S250] U.S. Federal Census 1930 U.S. Federal Census, by Ancestry.com, ED64-10. Dwelling 70. Name Variation Rolland Percival Abraham was also known as Roland. Rolland Percival Abraham was born on 9 May 1922 at Spink, Union, South Dakota, twin with Russell Lester. Rolland Percival Abraham was baptized on 3 June 1922 at Brule Creek Lutheran Church, Union, South Dakota. He married Ona L. Johnson, daughter of John Emil Johnson and Hilma Albertine Frick, on 1 January 1944. Rolland Percival Abraham died on 2 November 2006 at age 84 Rolland Abraham was born May 9, 1922 near Spink, SD to parents John and Selma (Solaas) Abraham. He died Thursday, November 2, 2006 in Alcester, SD at the age of 84 years, five months and 23 days. Rolland was raised and educated in Union County, SD. He attended Brule Creek Lutheran Church where he was baptized and confirmed. Rolland married Ona Johnson on January 1, 1944; to this union four daughters, Diane, Lynette, Nancy and Laurie, were born. He joined the US Army and served during WWII as a military police. Following his enlistment, Rolland returned home and began farming. After 47 years of making their home on a farm near Beresford, they retired to Alcester. Rolland was a member of the Beresford VFW. His parents, twin brother, Russell, and brothers, Delmer and Verdell preceded him in death. He is survived by his wife Ona; four daughters, Diane Larson of Huron, Lynette (David) Nelson of Volga, Nancy (Mike) Lyle of Canton and Laurie Filley of Kansas City, MO; 11 grandchildren; 12 great-grandchildren; one sister, Deloris (Duane) Johnson of Beresford; and two sisters-in-law, Evelyn Abraham of Beresford and Wilda Abraham of Elk Point. Funeral services will be held at 10:00 a.m. on Saturday, November 4, 2006 at Dalesburg Lutheran Church, rural Beresford, SD. Visitation will be from 2:00-8:00 p.m. on Friday at Wass Funeral Home in Alcester with the family present from 6:30-8:00 p.m.
Rolland Percival Abraham was confirmed on 25 July 1937 at Brule Creek Lutheran Church, Union, South Dakota. He and Ona L. Johnson lived in 2000 at 405 SD Highway 11, Alcester, South Dakota. Rolland Percival Abraham lived in April 2004 at Alcester, South Dakota. Name Variation Delmer Leon Abraham was also known as Delmar. 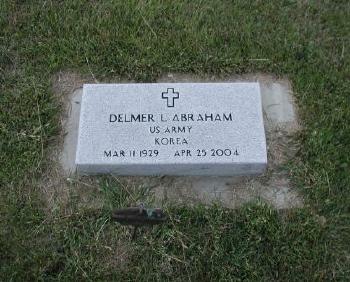 Delmer Leon Abraham was born on 11 March 1929 at Beresford, Union, South Dakota. Delmer Leon Abraham was baptized on 31 March 1929 at Brule Creek Lutheran Church, Union, South Dakota. He was buried on 28 April 2004 at Brule Creek Lutheran Cemetery, Spink, Union, South Dakota, US Army Korea. Delmer Leon Abraham was confirmed on 17 January 1943. He lived in 2000 at Elk Point, South Dakota. Name Variation Raymond Verdell Abraham was also known as Ramond. Name Variation Raymond Verdell Abraham was also known as Verdell. Raymond Verdell Abraham was born on 18 January 1935 at Beresford, Union, South Dakota. 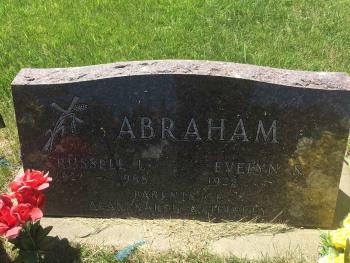 Raymond Verdell Abraham died on 25 December 1982 at Jackson, Jackson, Minnesota, at age 47. He was buried on 28 December 1982 at Vermillion, Clay, South Dakota. Married Name 18 January 1933 As of 18 January 1933,her married name was Abraham. Helen Lillian Erickson was born on 15 November 1910. 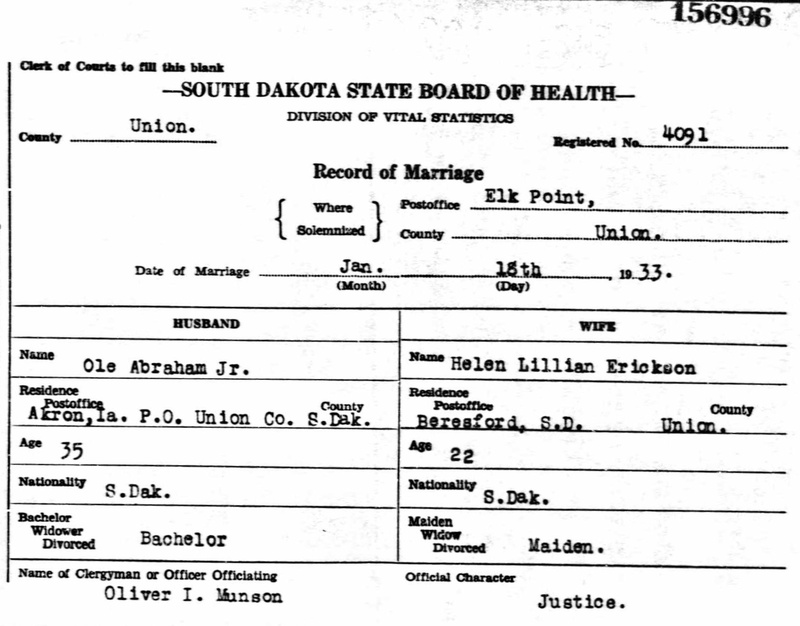 Helen Lillian Erickson obtained US Social Security Card at Iowa; last residence Beresford, Union, South Dakota. On 15 September 1935 at Spink, Union, South Dakota, attended Abraham Family Reunion at home of Mrs Julia Abraham. [S184] Beresford Republic Newspaper, Vol. 108, 2001, Jan 18. He was the son of Henry Claussen and Tillena Muller. Darrell Muller Claussen married Alma Katherine Abraham, daughter of Peder Abrahamson and Julia Christine Christensen, on 27 August 1925 at Canton, Lincoln, South Dakota. Darrell Muller Claussen obtained US Social Security Card at South Dakota; last residence Beresford, Union, South Dakota. On 15 September 1935 at Spink, Union, South Dakota, attended Abraham Family Reunion at home of Mrs Julia Abraham. [S9] South Dakota, South Dakota Birth Records South Dakota, State File Number: 573819 (unknown file date). [S184] Beresford Republic Newspaper, Vol. 73, 1966, Mar 31. [S245] U.S. Federal Census 1900 U.S. Federal Census, by Ancestry.com, ED218. Dwelling 34. [S244] U.S. Federal Census 1910 U.S. Federal Census, by Ancestry.com, ED272. Dwelling 245. [S243] U.S. Federal Census 1920 U.S. Federal Census, by Ancestry.com, ED129. Dwelling 41. [S250] U.S. Federal Census 1930 U.S. Federal Census, by Ancestry.com, ED64-3. Dwelling 13. Name Variation Henry Claussen was also known as Clausen. Name Variation Henry Claussen was also known as H.
Henry Claussen was born on 24 August 1856 at Germany. Henry Claussen married Tillena Muller, daughter of John Peters Muller and Grace Janssen Klein, on 16 September 1898 at Canton, South Dakota, also reported as Illinois. [S186] Illinois, Illinois Statewide Marriage Index, listed under Henry Claussell. [S184] Beresford Republic Newspaper, Vol. 31, 1924, Mar 20. [S246] U.S. Federal Census 1880 U.S. Federal Census, by Ancestry.com, ED155. Page 15. Dwelling 136. Name Variation Tillena Muller was also known as Tillie. Name Variation Tillena Muller was also known as Tilla. Married Name 1898 As of 1898,her married name was Claussen. Tillena Muller was born on 11 October 1873 at El Paso, Woodford, Illinois. She was the daughter of John Peters Muller and Grace Janssen Klein. Tillena Muller married Henry Claussen on 16 September 1898 at Canton, South Dakota, also reported as Illinois. Tillena Muller died on 11 May 1960 at Beresford, Union, South Dakota, at age 86. She was buried on 13 May 1960 at Zion Cemetery, Beresford, Union, South Dakota. Tillena Muller had 1 with 1 living in 1910 children. [S246] U.S. Federal Census 1880 U.S. Federal Census, by Ancestry.com, NA Film Number T9-0229 Sheet 614C. [S250] U.S. Federal Census 1930 U.S. Federal Census, by Ancestry.com, ED42-1. Dwelling 53. Name Variation Mary Jane Imbrock was also known as Marie. Married Name 17 August 1950 As of 17 August 1950,her married name was Abrahamson. Mary Jane Imbrock was born on 2 June 1907 at Iowa. She was the daughter of Herman Imbrock and Freda Gertie Twillman. 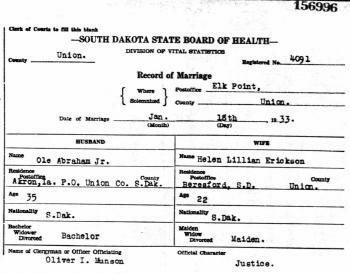 Mary Jane Imbrock married Clarence Melvin Abrahamson, son of Peder Abrahamson and Julia Christine Christensen, on 17 August 1950 at Hudson, Lincoln, South Dakota. Mary Jane Imbrock died on 6 November 1978 at South Dakota at age 71 Mrs. Clarence Abrahamson, 71, Beresford, died Monday, (Nov. 6, 1978) at the Viborg hospital. Services will be held at 1:30 p.m. Thursday at Emmanuel Lutheran church in Beresford. The Rev. Jalmer Eldal and Rev. Richard Peterson will officiate. The Wass funeral home is in charge of arrangements. Mrs. Abrahamson, the former Mary Imbrock, was born June 2, 1907, in Ireton. As a child, she moved with her parents to Hawarden. She was married Aug. 17, 1950, in Hudson. She worked as a waitress in several cafes in Hawarden, Beresford and Vermillion. Survivors include the widower; two brothers, William of Centerville and George in California, and a sister, Mrs. Martha Tracy of Orange, Calif.
1 January 1925 Hawarden Ward 3, Sioux, Iowa Mary Jane Imbrock appeared on the census of 1 January 1925 in the household of James Dauberman at Hawarden Ward 3, Sioux, Iowa. Mary Jane Imbrock obtained US Social Security Card at Iowa; last residence Beresford, Union, South Dakota. [S244] U.S. Federal Census 1910 U.S. Federal Census, by Ancestry.com, Year: 1910; Census Place: Reading, Sioux, Iowa; Roll: T624_423; Page: 6A; Enumeration District: 0154; Image: 1224; FHL Number: 1374436. [S250] U.S. Federal Census 1930 U.S. Federal Census, by Ancestry.com, Year: 1930; Census Place: Ireton, Sioux, Iowa; Roll: 683; Page: 3A; Enumeration District: 25; Image: 249.0. 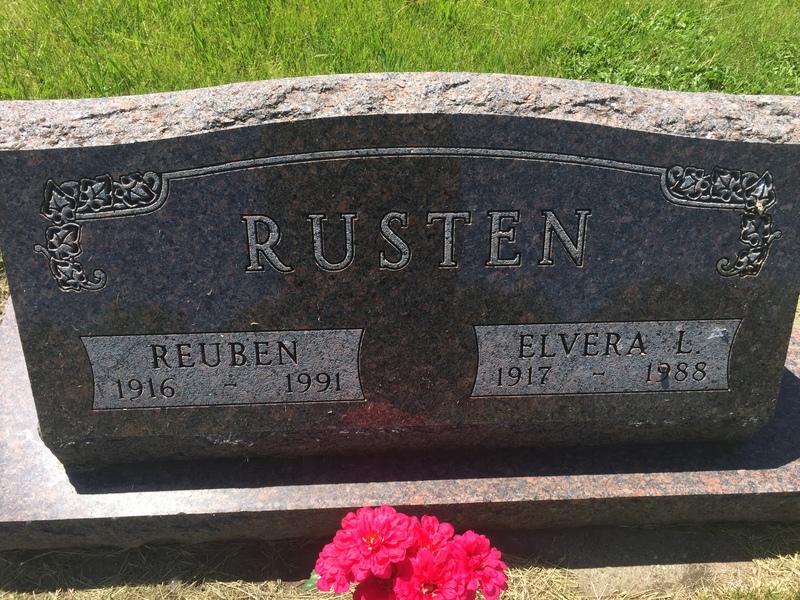 Name Variation Reuben Rusten was also known as Rueben. 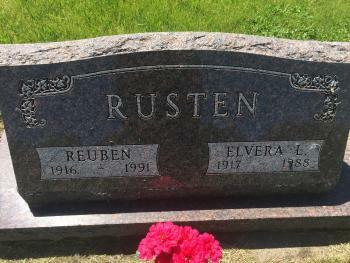 Reuben Rusten was born on 22 September 1916 at Beresford, Lincoln, South Dakota. He was the son of Erland Jacob Rusten and Anna Emelia Nelson. He was buried on 15 November 1991 at Brule Creek Cemetery, Spink, Union, South Dakota. Reuben Rusten obtained US Social Security Card at South Dakota; last residence Alcester, Union, South Dakota. [S184] Beresford Republic Newspaper, Vol. 98, 1991, Nov 21. [S243] U.S. Federal Census 1920 U.S. Federal Census, by Ancestry.com, ED136. Dwelling 113. [S250] U.S. Federal Census 1930 U.S. Federal Census, by Ancestry.com, ED42-18. Dwelling 100. Name Variation Erland Jacob Rusten was also known as Edward J. Name Variation Erland Jacob Rusten was also known as E. J.
Erland Jacob Rusten was born on 25 January 1870 at Lejaskogen, Gudbrandsdalen, Norway. He was the son of Karl Rusten and Kari Endreson. Erland Jacob Rusten married Anna Emelia Nelson, daughter of Peter J. Nelson and Mariah Beret (? ), on 11 July 1893 at Lands Lutheran Church, Canton, Lincoln, South Dakota. He was buried after 16 November 1957 at Lands Lutheran Cemetery, Canton, Lincoln, South Dakota. Erland Jacob Rusten was a farmer. He immigrated in 1886 to from Norway. He immigrated with Kari Endreson in 1886. [S362] South Dakota, South Dakota Death Index, 1905-1955. [S245] U.S. Federal Census 1900 U.S. Federal Census, by Ancestry.com, ED218. Dwelling 176. [S244] U.S. Federal Census 1910 U.S. Federal Census, by Ancestry.com, ED272. Dwelling 45. [S9] South Dakota, South Dakota Birth Records South Dakota, State File Number: 490479 (unknown file date). [S9] South Dakota, South Dakota Birth Records South Dakota, State File Number: 490480 (unknown file date). Name Variation Anna Emelia Nelson was also known as Annie Amelia. Married Name 11 July 1893 As of 11 July 1893,her married name was Rusten. Anna Emelia Nelson was born in June 1874 at Cherokee, Cherokee, Iowa. She was the daughter of Peter J. Nelson and Mariah Beret (?). Anna Emelia Nelson married Erland Jacob Rusten, son of Karl Rusten and Kari Endreson, on 11 July 1893 at Lands Lutheran Church, Canton, Lincoln, South Dakota. Anna Emelia Nelson had 3 with 3 living in 1900 children. She had 10 with 8 living in 1910 children. [S246] U.S. Federal Census 1880 U.S. Federal Census, by Ancestry.com, NA Film Number T9-0113 Page Number 360A. Jens Moller Larson was born on 10 April 1885 at Greensfield, Clay, South Dakota. He married Ida Andrea Abraham, daughter of Peder Abrahamson and Julia Christine Christensen, on 22 March 1911 at Union, South Dakota, also reported as 1910. Jens Moller Larson and Ida Andrea Abraham were divorced circa 1918. Jens Moller Larson died on 1 March 1931 at Beresford, Union, South Dakota, at age 45. He was buried after 1 March 1931 at Greensfield, Clay, South Dakota. Married Name 21 June 1941 As of 21 June 1941,her married name was Rohlfsen. Irene Julia Larson was born on 2 June 1912 at Union, South Dakota. She was the daughter of Jens Moller Larson and Ida Andrea Abraham. Irene Julia Larson was baptized on 11 August 1912 at Brule Creek Church, Union, South Dakota. She married Ralph Frank Rohlfsen on 21 June 1941 at Sioux Falls, Minnehaha, South Dakota. Irene Julia Larson died on 12 April 1998 at age 85. Irene Julia Larson obtained US Social Security Card at Iowa; last residence Sioux City, Woodbury, Iowa. She lived at Sioux City, Iowa. [S250] U.S. Federal Census 1930 U.S. Federal Census, by Ancestry.com, ED64-3. Dwelling 160. Married Name 2 November 1943 As of 2 November 1943,her married name was Jamtgaard. Martha Darline Sommervold was born on 28 August 1917 at Red Elm, Zweibach, South Dakota. She was the daughter of John Konrade Sommervold and Petrene Abraham. Martha Darline Sommervold died on 9 February 2012 at age 94 Martha Darline (Sommervold) Jamtgaard was born August 28, 1917 near Red Elm, South Dakota (Ziebach County) where her parents, John Konrad and Petra (Abraham) Sommervold homesteaded. 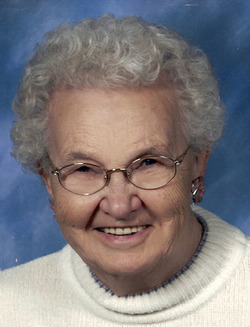 She passed away February 9, 2012 at Bethesda Home after a short stay and under Hospice care. Her Goddaughter, Darlene Zweifel, was at her side. The Sommervold’s lived “out West”, as Martha referred to it, until she was seven years old. They moved to the Merrigan place just north of Spink, South Dakota in 1924 so Martha could start school in the fall. She didn’t like school very much, but her favorite teacher, Miss Eidem, was an inspiration. Martha enjoyed drawing and writing poems. She entered a contest with a drawing of two ducks and won $1.00 along with a personal congratulation letter from the Superintendent. After 8th grade graduation, Martha was a housekeeper for relatives, neighbors, and friends for mothers of newborns. Martha was baptized and confirmed at Roseni Lutheran Church. She married Marvin LeRoy Jamtgaard on November 2, 1943 at Lands Lutheran Church while on Army leave. After the wedding, they were stationed in Newport News, Virginia and El Paso, Texas before moving to Marvin’s Aunt Sophie’s farm just north of Nora in 1945. In 1956, Marvin and Martha bought the current farm 3 ½ miles east of Beresford where Martha continued to live until she passed away. She joined Emmanuel Lutheran Church and shared her talents. During her 94 years, she enjoyed teaching Sunday School, Ladies Aid, bible studies, bowling, and always a fan at Marvin’s softball and horseshoe games. They were blessed with three daughters, a foster daughter, nine grandchildren and twelve great-grandchilden. Martha worked hard all her life, but found time to enjoy sewing, embroidery, crocheting, making bread, cakes, cookies, canning, and gardening. One of her biggest thrills was sewing gowns and collars for Emmanuel’s choir in 1981. She always “had the coffee pot on” for anyone who stopped by for a chat. She collected rocks for years and everywhere she went she managed to add to her collection. Because of her love of rocks, it led her to build a fireplace in their home and a wishing well in the front yard topped with the bell tower from the North Spink schoolhouse she attended as a child. Marvin and Martha planted all the trees but three on their current farm, most of the evergreens were just a sprig when planted, but Martha would carry a 5-gallon pail of water to each one. She loved nature. Her dream to go to Norway came true in 2005. She traveled with her three daughters and 20 other Abraham family members. The trip began in Bergin and continued to Oslo, visiting family farms and attending the Abraham family reunion. Among those who survive and gratefully shared her life are her daughters, Jeanette Silva, Beresford, SD and three sons, Michael (Laurie) and daughter, Maris, Nashville, TN; Nathan (fiancé Kirsten Vascik) Oklahoma, OK; and Richard, Redmond, WA; Janice (Gary) Coleman, Dante, SD and daughter, Heidi(Chris) Howard and sons, Cameron and Caden, Pueblo West, CO; and son, Sean (Christi) and daughter, Eliza, and two sons, Isaiah and Anderson, Breckenridge, MN; Linda (Gary) Cummings, and daughter, Molly, Beresford, SD; Lillian (Dan) Holm, Hermantown, MN and three daughters, Angie Jonas and two sons, Trey and Tanner, Rochester, MN; Suzi (Herbie) Dillon and two daughters, Taylor and Sadie; Sara (Troy) Bolen and two daughters, Shania and Sierra, Hermantown, MN; one brother, Morris Sommervold, Inwood, IA; two brothers-in-law, Bruce Nilson, Fergus Falls, MN and Robert Hammitt, Alcester, SD. Martha is preceded in death by her loving husband, Marvin; parents, John K. and Petra Sommervold; two sisters, Mildred (Clarence) Zweifel and RuAdene (Bruce) Nilson; two sisters-in-law, Helen (Morris) Sommervold and Grace (Robert) Hammitt; and one nephew, Scott Hammitt. Visitation is scheduled at Emmanuel Lutheran Church in Beresford, SD on Friday evening, February 17th from 6:00PM to 8:00PM with the family present and a prayer Service at 7:00PM. Funeral services will be held at Emmanuel on Saturday, February 18th at 2:00PM. Memorials can be given in Martha’s honor by planting a flower, bush, or tree for yourself or others. On 14 September 1975 at Spink, Union, South Dakota, attended Petra (Abraham) Sommervold 80th birthday celebration. [S243] U.S. Federal Census 1920 U.S. Federal Census, by Ancestry.com, ED 218. Stamp 245. Sheet 3A. Dwelling 28. [S250] U.S. Federal Census 1930 U.S. Federal Census, by Ancestry.com, ED64-15. Dwelling 99. Married Name 20 February 1949 As of 20 February 1949,her married name was Zweifel. Mildred Jeanette Sommervold was born on 13 April 1919 at Red Elm, South Dakota. Mildred Jeanette Sommervold died on 26 August 2007 at age 88 Mildred Jeanette (Sommervold) Zweifel was born April 13, 1919 on her parents, John and Petra (Abraham) Sommervold, homestead near Red Elm, South Dakota (near Faith, SD). She died at Bethesda of Beresford August 26, 2007 at the age of 88 years, four months and 13 days. She, at age four, moved with her parents and older sister, Martha to a farm north of Spink, SD where her brother, Morris and sister, RuAdene Rudi were born. Mildred attended North Spink School in Union County, SD for eight years. She began working for various families in the area and in Sioux City, Iowa before moving to Beresford where she worked for the Farmers Union Grocery and later Breuhlers Pharmacy until she married Clarence Zweifel on February 20, 1949. The couple lived on the Zweifel farm northeast of Beresford where they farmed with his brother Albert. Mildred enjoyed family and friends, flowers, working in her garden and caring for her home. She was a former member of Roseni Lutheran Church of rural Beresford and Lands Lutheran Church in rural Hudson, SD. She was a current member of Emmanuel Lutheran Church in Beresford, was active in WELCA and taught Sunday and Bible Schools. Mildred was a member of the Friendly Hour Club for over 50 years. Survivors include her husband, Clarence; daughter, Darlene Zweifel; sons, John (Valerie) Zweifel, David (Linda Kay) Zweifel and Royal (Kay) Zweifel all of Beresford; eight grandchildren, Heather Zweifel, Danelle (Tom) Kamnikar of Sioux Falls, Janelle Zweifel and Greg Behr of Murfreesboro, TN, Gregory Zweifel and Candace Jensen of Beresford, Mark (Shana) Zweifel of Harrisburg, Lori (Anthony) Laurvick, Luke Zweifel and Lisa Zweifel all of Beresford; great-grandchildren, Austin Zweifel of Murfreesboro, TN, Maggie and Lily Kamnikar of Sioux Falls and soon to arrive child of Mark and Shana. Mildred is also survived by her sister, Martha Jamtgaard of Beresford; brother, Morris Sommervold of Alcester; brother-in-law, Bruce Nilson of Fergus Falls, MN; sisters-in-law, Katherine Krause, Lorene (Freeman) Swanstrom and Laura Zweifel all of Beresford, Iona Carlson of Sioux Falls and Esther Zweifel of Alcester; two aunts, Violet Sand of Viborg and Margaret Sommervold of Sioux Falls and many nieces and nephews. Her parents; sister, Rudi Nilson; sister-in-law, Helen Sommervold; brothers-in-law, Edwin, Jacob, Albert, Emil, Walter Zweifel, Walter Krause, Merle Carlson and Marvin Jamtgaard preceded her in death. Morris Norman Sommervold was born on 22 July 1925 at Union, South Dakota. He was the son of John Konrade Sommervold and Petrene Abraham. Morris Norman Sommervold died on 20 July 2012 at age 86 Morris Sommervold was born July 22, 1925 in Union County, South Dakota to parents John K. and Petra (Abraham) Sommervold. He died July 20, 2012 at the Sioux Falls VA Hospital at the age of 86 years, 11 months and 28 days. Morris was raised and educated in Alcester graduating from Alcester High School. He served in the US Army during WWII. Following his honorable discharge he returned home. He married Helen Loftesness February 4, 1949. Morris was a farmer and operated an excavating business, from which he retired in 1987. After Helen died in May 2001, he continued to live in Alcester. Morris moved to a veterans care home in Inwood, Iowa in 2010. He and Helen loved ballroom dancing and traveling. Morris liked reading, shooting pool and he belonged to a Snooker team. Recently, he enjoyed going for drives with his family to check the crops and see the countryside. Survivors include his son, Kurt (Michelle) Sommervold of Alcester; daughters, Karen (Martin) Buum of Waseca, MN and Karla (Bob) Osterday of Luverne, MN; seven grandchildren, Erin (Mike) Benolkin, James (Quinn) Buum, Angela (Wayne)Meyer, Brian (Hillary) Osterday, Teresa (Craig) Nelson, John (Tonia) Sommervold and Erik (Sophia) Sommervold; 10 great-grandchildren, Jack and Andrew Benolkin, Charlotte Buum, Brooklyn and Benjamin Meyer, Micah Nelson, Cameryn, Jaxon, Izzac and Karzen Sommervold; and many nieces, nephews and friends. His wife, parents, grandson, Ryan Sommervold, and three sisters, Martha Jamtgaard, Mildred Zweifel and Rudie Nilson preceded him in death. 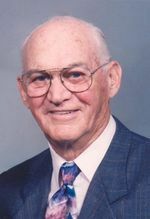 Funeral services for Morris Sommervold will be 2PM Tuesday, July 24, 2012 at Lands Lutheran Church, rural Hudson, SD. Visitation will be 4-8PM Monday at Wass Funeral Home in Alcester, SD. The family requests memorials to Lands Lutheran Church. Name Variation RuAdene Phyllis Sommervold was also known as Rudie. Name Variation RuAdene Phyllis Sommervold was also known as Rudi. Married Name Her married name was Nilson. RuAdene Phyllis Sommervold was born on 17 April 1934. RuAdene Phyllis Sommervold died on 18 April 2004 at age 70. RuAdene Phyllis Sommervold obtained US Social Security Card at South Dakota; last residence Fergus Falls, Otter Tail, Minnesota. Name Variation Lars Peterson Solaas was also known as Lars Pedersen. Lars Peterson Solaas was born on 31 December 1849 at Solaas, Orkendalen, Norway. He was the son of Peder Thoresen and Marit Mortensdtr. Lars Peterson Solaas married Selma Augusta Peterson, daughter of Peter Karlsson and Christina Karlsdotter, on 30 July 1879 at Union, South Dakota. Lars Peterson Solaas married Johanna Olena Johanson in 1893. L. P. Solaas, early day homesteader in Emmet Township, died shortly after noon Tuesday at the Bethesda Home for the Aged where he has lived since 1926 and where he has been confined to his bed under the care of a special nurse for the last two years. Funeral services will be held Monday afternoon from the Home and later at the Roseni church in charge of Rev. M. O. Ensberg. He will be buried in the Roseni cemetery beside his wife. Mr. Solaas was 83 years old having been born at Solaas, Orkedalen, Norway December 31, 1849. He came to America in May, 1870 and homesteaded in Emmett township where he farmed for many years. Later he and his wife moved to Beresford where she died December 16, 1921. On January 9, 1926 he entered the Bethesda Home where he resided until his death. Mr. Solaas was married twice and was the father of 12 children, eleven of whom survive him. Funeral services have delayed pending the arrival of a son, Oliver, who is in the United States navy and who is expected to arrive here tomorrow or Saturday from California. He was buried on 28 March 1932 at Roseni Cemetery, Union, South Dakota, Grave 4, Lot 36, Block 1. Lars Pedersen took the name Lars Pedersen SOLAAS, (Lars P. Solaas) when he immigrated to America at the age of20 in 1870 and eventually settled in South Dakota. Both of his parents were deceased before he came to America. [S184] Beresford Republic Newspaper, Vol. 39, 1932 (Mar. 24). [S250] U.S. Federal Census 1930 U.S. Federal Census, by Ancestry.com, ED42-22. Sheet 7A. The index was compiled by Joy R. Fisher Std Atlas of Union Co, SD, Pg 27. [S9] South Dakota, South Dakota Birth Records South Dakota, State File Number: 793202 (unknown file date). Married Name 1893 As of 1893,her married name was Solaas. Johanna Olena Johanson was born circa 1864 at Norway. She married Lars Peterson Solaas, son of Peder Thoresen and Marit Mortensdtr, in 1893. Johanna Olena Johanson died on 16 December 1921. She was buried after 16 December 1921 at Roseni Cemetery, Union, South Dakota, Grave 3, Lot 36, Block 1. Johanna Olena Johanson immigrated in 1870 to Norway. She had 9 with 8 living in 1910 children.